Regional journalists the length and breadth of the country have once again spent the past 12 months fighting for their patches and the people who live in them. But for one regional daily, it was a fight for justice that lasted no less than 27 years. The Liverpool Echo’s acclaimed campaign to get justice for victims of the Hillsborough disaster finally achieved its goal in April, with a jury reaching a verdict of unlawful killing over the deaths of 96 Liverpool Football Club supporters in 1989. 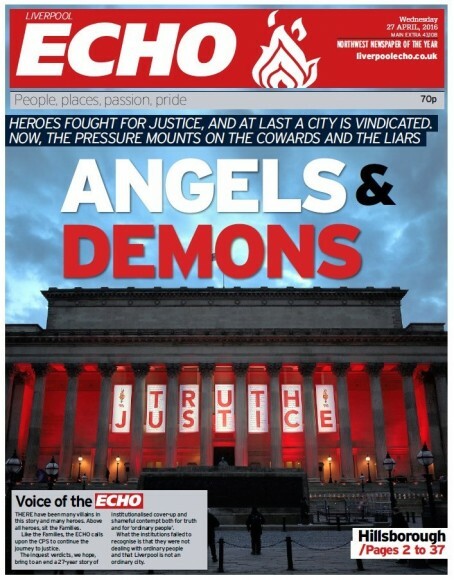 The Echo’s coverage of the inquests, which saw a reporter present in court for every day of the two year-long hearing, saw it win several industry accolade including a special chairman’s award at May’s Regional Press Awards. Other long-running campaigns that came to fruition in 2016 included Brighton daily The Argus’s 15-year battle to rename a historic pier. And the Worcester News scored success after a five-year fight to get a new breast cancer care unit opened on its patch. The Yorkshire Post’s ongoing campaign to tackle loneliness continued to gain traction after it was given a seat on a cross-party commission into the issue set up by Batley & Spen MP Jo Cox, who would tragically go on to lose her life at the hands of terrorist Thomas Mair in the days leading up to June’s EU referendum. And the Royal Sutton Coldfield Observer’s 11-year bid to honour 17 people killed in a 1955 rail crash concluded with the unveiling of a memorial plaque at the town’s railway station. The Times ran a successful six day bid to stop parking charges from car parking charges from being introduced in four towns after threatening to ‘out’ 17 unnamed councillors who supported the idea. Their names were later revealed after a Freedom of Information request by the paper. Also in January, a breast cancer nurse began work after the Hereford Times raised more than £60,000 as part of its One in Eight Appeal, which later won the Campaign of the Year prize at May’s Regional Press Awards. The following month,the Warrington Guardian helped local band Viola Beach posthumously reach the charts after its members died in a car crash in Sweden. It was a busy year on the campaigning front for the Birmingham Mail. In February it forced the Lord Mayor elect of Birmingham, Councillor Muhammad Afzal, to announce he was withdrawing from the role after declaring him “unfit” for office following controversial remarks he had made about anti-terror measures. The paper later also won its fight to reopen inquests into the deaths of 21 people killed in the 1974 Birmingham pub bombings. Also making political waves was the Derby Telegraph whose exclusive revelations about experiments on children at a mental hospital during the 1960s and 1970s led to questions in the Commons, while police in Essex also launched a probe into historic child abuse after the Yellow Advertiser’s year-long investigation into claims of an establishment cover-up. Legal highs were outlawed after campaigns from the Kent Messenger, North West Evening Mail and Southern Daily Echo, while the Wolverhampton Express & Star succeeded in getting a ban on so-called ‘zombie knives. Other papers who made a difference in 2016 included the Teesdale Mercury, which helped save a remote school with just 14 pupils from closure, the Edinburgh Evening News, which saved a city farm, and the Stourbridge News, which raised enough cash to provide a fresh water tap for an African village. And the Manchester Evening News exposed a health trust’s attempt to cover-up a report revealing that mums and babies had died at two hospitals because of bad medical decisions and chronic staff shortages. As the nation continues to mark 100 years since some of the First World War’s bloodiest battles, a memorial stone dedicated to the Bradford Pals who lost their lives in the Battle of the Somme was unveiled in France after a campaign by the Bradford Telegraph & Argus. On a lighter note, Aberdeen Football Club pledged to improve the standard of its pies after Aberdeen Evening Express sports editor Charlie Allan complained about them in a column for the newspaper, while the Coventry Telegraph managed to get a road named after former Coventry City boss Jimmy Hill.